Browsing through that great website EarthBeatRadio out of Portland, Oregon, I came across a reference to Dan Imhoff’s book on the upcoming Farm Bill entitled Food Fight: A Citizen’s Guide To The Farm Bill which you can read about here. I really respect the writer’s assertion that each and every American needs to know and help formulate the details of the Bill, which is renewed every five years. Farm policies ultimately determine the nutrition we receive. Making informed choices at the “pull” end — by demanding grassfed beef above other kinds for instance– and getting involved in “push” factors — like making sure the Farm Bill is environmentally friendly — are the only ways individuals can meaningfully change the way we in the United States look at farming, and determine how the land is used and what practices are in place. She Had A Beef, But Not Any More! A lot of good things start at home. Like charity. Like eating healthy. Like awareness of things pure and things green. And who better to know about all these good things than a home-schooling mom of five great kids aged 14 to 23? A lady calling her blog Working Out The Quinques (and calling herself Bensrib) tells a chilling story about her daughter Abbie who got sick eating take-out burgers — and not from just one take-out line either. Eventually Abbie was getting sick even after sit-down steak meals in restaurants. She went off eating beef entirely. Read the whole sordid saga here. Eventually Abbie couldn’t even stomach the thought of beef — until a friend advised her mom to get some real beef – the kind that says, “grass fed cattle, never given antibiotics or growth hormones.” So the lady did. And you know what? Abbie didn’t get sick! Now Abbie has discovered a restaurant that serves grassfed beef so she can eat beef in restaurants again. Now, that’s just one mom sharing, as she says, her thoughts about her little corner of the world. 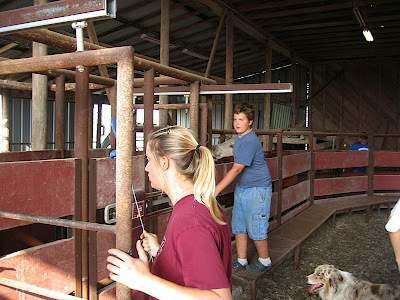 It makes you wonder how many other kids in other little corners of the world are sick because of beef contaminated by all sorts of hormones and chemicals…..
Two or three times a year we run the cattle through the chute and weigh them and look them over carefully to see if they need any particular care. Maybe they just need to have their ear tag renumbered. Sally is one of our mini Australian Shepherds. She has a strong herding instinct and loves to get involved any time we move cattle. She’s quite the fast runner too. She’s a real sweetheart. This one looks like a giant SteakBurger. This one is a perfect likeness of our milk cow, Sugar. Give the Gift of Pancreatic Cancer? I stumbled on a controversial cartoon by Mike Adams posted at www.newstarget.com. It features two women standing at a display case looking to buy some sausage product from “Hickary Farms”. The sign board above the display has the sub-headline of “Give the Gift of Pancreatic Cancer”. Yikes! It also says the sausage is made with “real processed meat” and “made with real chemicals”. Makes you want to reconsider what you eat. Check it out here. I thought I lost this picture, but here it is. It was taken in April, 2007. 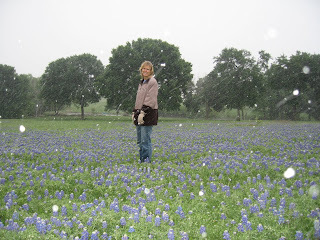 The Blue Bonnets were in full bloom, the trees had all their leaves. Then this snow storm hits and it snows all day, the day before Easter. Diane and I went out that evening to get some pictures. I was amazed at how hard it snowed that day. The football players and cheerleaders wanted to make this year’s homecoming bonfire the greatest of all time. 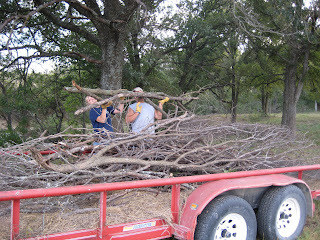 They also did a nice service to come over our place and gather up loads of fallen limbs. Not everyone was up to the work. 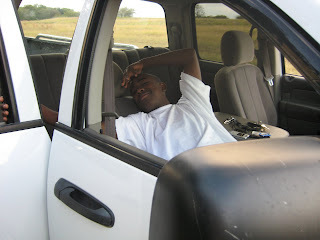 Avery was suffering from a massive toothache and had to take a break. 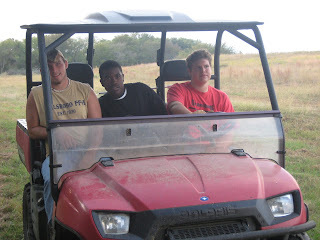 Eric took a couple of the guys around on the Ranger, “looking for more wood”. But a lot of wood got collected. Unfortunately, the bonfire was cancelled because of high winds that day. It will be rescheduled for a pep rally preceding the playoffs. 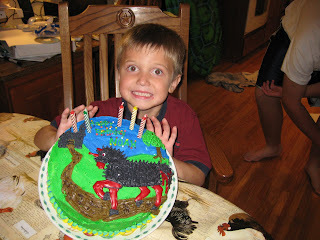 This is exactly the creature Noah requested that Diane put on his birthday cake. He’s thrilled! 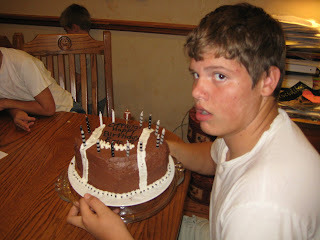 Eric’s also happy about his “football” cake; don’t let that expression fool you.